Automated Passport Check is only available for local passengers who own Electronic Passports. Passport holders can go through self-serviced automated passport check system which helps locals to clear through passport check process easily. If you are priority passenger (First Class, Business Class, and Priority cards) you will be given FastTrack card on board which you can use to clear through Immigration on a dedicated queue for all Fastrack card holders. Please note that you might be asked to declare certain types of items when you clear through Customs. Your luggage is screened before you receive them at Baggage Claim. 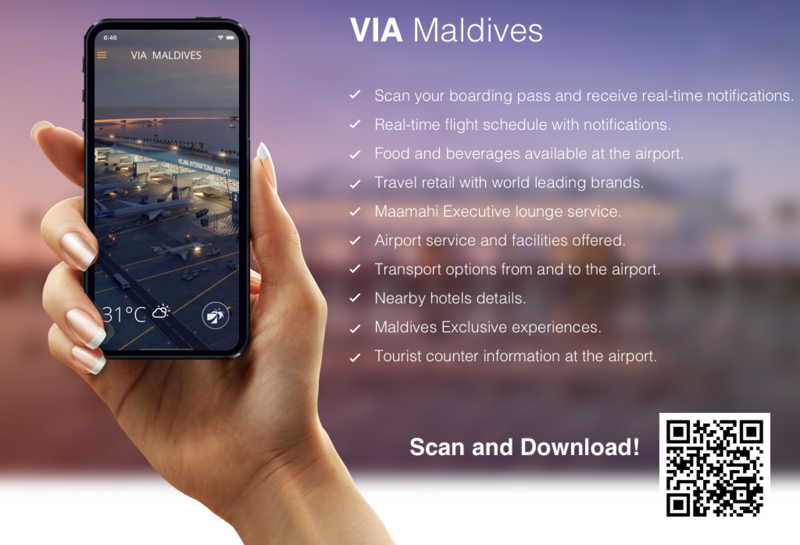 However, you might be asked to do the second screening, if your luggage contains items that are restricted, prohibited to bring Maldives or have items that are for commercial use. Hence, it is advised not to purchase liquor and alcoholic products on the flight or duty free shops while en-route to the Maldives as these items will be confiscated upon arrival at the airport. You can enjoy our free Wi-Fi service up to 25 Minutes as soon as you arrive to Maldives. To use the Wi-Fi Service, just select the Wi-Fi network “Airport Wi-Fi” from the list of available Wi-Fi networks and you will be prompted to provide your mobile number (With country Code). Once you enter the mobile number you can Request for Wi-Fi code which will be sent to your phone as an SMS. Please note that you will require either local SIM card or SIM card with roaming in order to get Wi-Fi code as an SMS. You may access wifi service from. Free Wi-Fi at International Duty free Area, Gate 1-2-3 Area, Arrival Hall. Currency Exchange counter is located just after you pass-through the Customs. This service is offered by the Bank of Maldives. There are other area that you may find money exchange counters. If you would like to buy a local SIM card or get roaming service for your mobile, please contact our telecommunication operators. Outlets are located. A Prayer Room is available on the first floor of the Departure Terminal. Two fully air-conditioned Mosques are located about 5 to 10 minutes walking distance from the Terminal Building to either side. As soon as you pass through the Immigration, your next step is baggage carousels. To find out the right baggage carousel for your flight, just check the displays on the screen on each belt. Did not receive your checked-in luggage or was it damaged? Our dedicated Lost and Found team staff will always be available. Our Baggage Services desk is just in front of baggage claim area. Report your claim and get Property Irregularity Report for your lost or damaged bag and let our team keep in touch with you. If your lost baggage information is pre-advised by airline, our Lost and Found staff will page your name in order to avoid unnecessary waiting time for your baggage claim. Have you forgotten one of your belongings in airport or in the flight? Like your shopping bag, mobile phone, e-book reader? Or a winter jacket. All items we find inside terminals or flights will be safely returned to Lost and Found. Claim your lost belongings below. If you lost a belonging while carrying with you, submit below Lost Item Inquiry form. Click Start to begin. If you wish to store some of your luggage at Airport, please contact the Help Desk outside arrival terminal. We offer free-of-charge Porter Service for all our passengers. If you need porter service on your arrival, you can get a porter at Baggage Claim area. Porters are available at Baggage Claim Area.